Here in Mid-Coast Maine the daylilies are poised for a big display of flower power. Though each of those glorious blooms only lasts a day — what color, what form and what beauty — daylilies are one of summer’s standards in the sunny garden. As much as we enjoy just looking at them, apparently there’s even more to like about daylilies — they taste good. And because the blooms are with us for just a day, we won’t mind dedicating a few to dishes like these that come from Maria Zampini’s delightful e-newsletter “Upshoot.” She informs us that daylilies, like Pocket Full of Gold (above left), are edible and gives us a couple ways to prove that. Remove the stamens, rinse, dry and fry whole or strips after coating in a batter mix like Whistle Stop. Include cleaned petals and chopped tender parts of stems and tubers in to salads. Going further down the daylily culinary route, she offers a special beverage made with — what else? — daylilies! Directions Make an infusion using 6 daylilies, ½ cup sugar, 2 cups of spring water. Bring to a boil. and simmer. Reduce by 1/3. Strain liquid and chill. Mix infusion equally with 1 part apricot juice, 1 part orange juice and 1 part 7-Up. Pour over remaining daylilies, serve with ice. Garnish with borage and monarda flowers. Tip – Eat daylilies in moderation, they can have a diuretic effect. Just out of the box, and ready to hit the ground running is a sampling of Proven Winners new shrubs and vines that arrived yesterday. There are some selections in this enticing mix we might not have thought about before — like Summer Shandy, an unusual climber with golden-yellow, finely-cut foliage. This frothy little number is actually a perennial hop. And although the hang tag tells me it does indeed produce buds (the hops) like those used for brewing beer, this one is all for show. Colorful all season, it is adaptable to most soils and hardy Zones 5-8. I have just the trellis for it. Another part of the shipment is Sonic Bloom red Weigela, and do I ever have a place for this reblooming shrub! Its lipstick-red blooms first appear in May, then return in waves until frost with bright flowers all season. What’s not to like about a Weigela that does that? Hardy to Zones 4-8, it will go into a sunny spot where a less-hardy shrub cashed in its chips this past winter. Daylily leafminer detected in U.S. 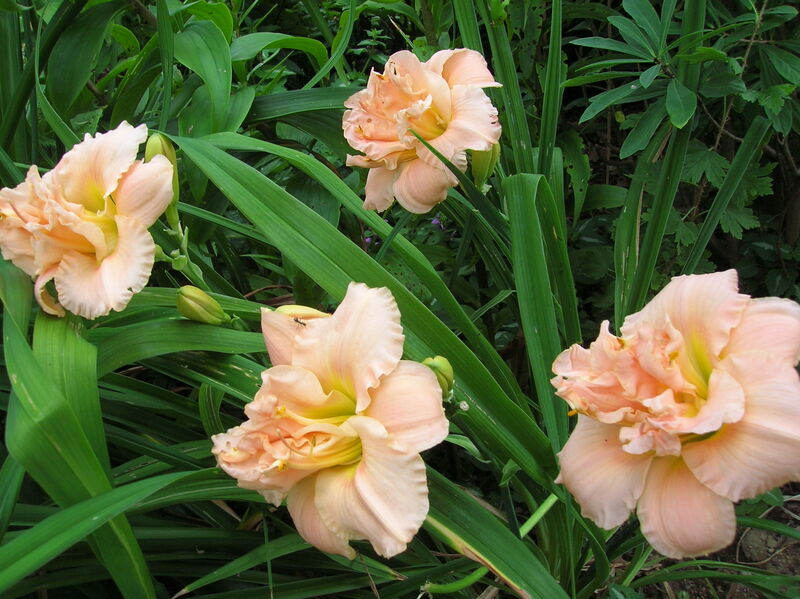 In many areas daylilies are in bloom or bud. Recent news of the presence of the daylily leaf miner should have both home and commercial growers on the lookout for this pest. “The daylily leafminer, Ophiomyia kwansonis Sasakawa, was newly identified in the U.S. last autumn. This insect, known previously only from Japan and Taiwan, has been confirmed by specimens in Florida, Maryland, Mississippi, Pennsylvania, Tennessee and Virginia, and has also been diagnosed in Alabama, Georgia, Louisiana, North Carolina, New York, South Carolina and Texas. Presence of the pest is evidenced by the unique mining damage in Hemerocallis leaves. Possibly the earliest U.S. documentation is an image taken on July 4, 2006, in Kennebunk, Maine Then, in 2008, damage was first noted by daylily enthusiasts at a national meeting in Texas. Some returned home to find it in their own plantings. Damage caused by the daylily leafminer, Ophiomyia kwansonis Sasakawa, is evident on foliage. Larvae feed only on leaves, mining between leaf surfaces and leaving obvious silver tunnels. A leafminer fl y rests on a daylily bloom. Although the larvae can cause considerable damage to Hemerocallis foliage, the fl ies do not appear to be harmful. The small (up to 5 mm), yellow maggot larvae feed only in leaves of Hemerocallis species and their cultivars, mining up and down as they feed between the leaf surfaces, leaving obvious silver tunnels that persist until leaves senesce or are removed. Multiple generations can create severe foliage disfigurement. Pupation occurs inside the larval tunnel, usually near the leaf base. The stocky, small (3 mm) black, adult flies often rest on daylily blooms. Although this insect doesn’t appear to kill plants, the leaf damage is of concern for display gardens. Also, as young pale larvae can be virtually invisible in tissue near the plant base, they may escape detection in nurseries when fans are being prepped for sale. At this time, implications for international trade are unknown, as this is a newly emerging pest for U.S. growers. No chemical controls have been formally tested on this insect. Contact sprays can’t reach the protected larvae; instead, they may kill predators of adults as well as the parasites targeting fly larvae and pupae. Removing and destroying infested leaves may reduce populations. However, daylily leafminer occurs in naturalized daylily stands, allowing reinfestation.